Dr. Jorge Arzola specializes in Urology with interest in oncology, female urology, urinary stone disease, male infertility, BPH, erectile dysfunction and prosthetics. He is one a few physciains in the Dayton area performing the Urolift procedure to treat enlarged prostate. He earned his undergraduate degree from the University of Rochester, New York. Dr. Arzola received his medical degree and performed his surgical internship at SUNY in Buffalo, New York. He then served as a U-2 Flight Surgeon at Beale AFB, California, and completed his Urology Residency with the U.S. Air Force at Wilford Hall. Dr. Arzola worked as a Urologist at Wright-Patterson AFB from 2008 to 2013 where he served as the Commander of the Surgical Specialties flight and Chief of the Urology element. He was deployed to Afghanistan as a Urologist from December 2011 to June 2012. Dr. Arzola was awarded the distinguished Emmett Broxson Award for Outstanding Compassion Patient Care in 2010. 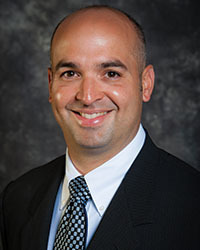 He is an Assistant Professor of Surgery at Wright State University and is Board Certified in Urology.